This post is Part Four of the Roofing Glossary of Terms series, covering topics S-Z. Part Three was for terms I-R. Shed roof: A roof containing only one sloping plane. Has no hips, ridges, valleys or gables.Found mostly on sheds and small lean-to buildings. Soil stack: A vent pipe that penetrates the roof. What does this mean for the homeowner? Each home has a number of soil stacks. The flashing around these pipes can age and/or deteriorate over time, especially if the home endures a number of high wind, rain, or hail storms in the spring and fall and ice and snow “storms” in the winter. Winds, for example, can bend or tear shingles and flashing away from the decking, introducing areas where water can seep underneath or behind and introduce problems that will need to be repaired in time. Make sure the Dallas and Fort Worth roofing company or contractor you use inspects soil stacks for wear and tear the next time they inspect your roof following a significant storm. Specialty eaves flashing membrane: A self-adhering, waterproofing shingle underlayment designed to protect against water infiltration due to ice dams or wind-driven rain. What does this mean for the homeowner? North Texas gets a lot of wind-driven rain, and ice dams do form in the winter, especially on shaded areas of the roof that does not get a lot of sun. If your roof has shaded spots where ice lingers, you may want to ask your roofing company or contractor in Dallas or Fort Worth to take a look and possibly install specialty eaves flashing. Flashing is a common roof repair. Talc: Same as back surfacing. Telegraphing: A shingle distortion that may arise when a new roof is applied over an uneven surface. What does this mean for the homeowner? This is an example of why it’s important to find a talented, professional roofing company or contractor in the Dallas and Fort Worth area to avoid shoddy installation and repair. Exceptional roofers will inspect a roof and know of any uneven surfaces before installation or repair. UL label: Label displayed on packaging to indicate the listing for fire and/or wind resistance of asphalt roofing. What does this mean for the homeowner? A reputable roofing company or contractor in Dallas and Fort Worth will use materials with the UL label, and homeowners should make note of the listing for fire and wind resistance ratings for future reference. Under-eave: Underside area of the overhang at the eave of the roof. Valley: The internal angle formed by the intersection of two sloping roof planes to provide water runoff. What does this mean for the homeowner? Valleys are visually interesting areas of roofs and architecture. 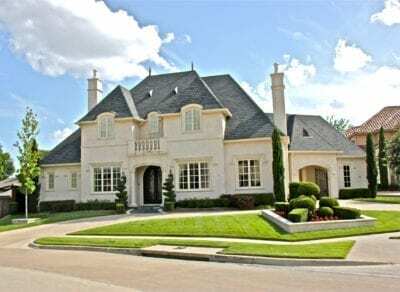 When a roof is being replaced, valleys provide a homeowner — through a talented roofing company or contractor in Dallas and Fort Worth — to change the look of their roof and enhance the overall aesthetics of their home by creatively using shingles and other materials in and around valleys. Vapor retarder: Any material used to prevent the passage of water vapor. Material which, when installed on the high-vapor-pressure (warm in winter) side of a material, retards the passage of moisture vapor to the lower-pressure (cold in winter) side. What does this mean for the homeowner? Your roofing company or contractor will check with local Dallas and Fort Worth-area building codes to determine on which side the vapor retarder should be placed. Vent: Any outlet for air that protrudes through the roof deck, such as a pipe or stack. Any device installed on the roof, gable or soffit for the purpose of ventilating the underside of the roof deck. What does this mean for the homeowner? The more vents installed on a roof, gable, or soffit, the more opportunity there is for leaks to development following storms or from aging. Also, know that the more vents roofers must work around during installation or repair may drive up the overall cost of the project. Ventilators: Devices that eject stale air and circulate fresh air (e.g. ridge, roof, gable, under-eave, foundation or rafter vents and vented soffit panels).